The Air Force has announced changes to officer training to accommodate single parents, military spouses and pregnant women. 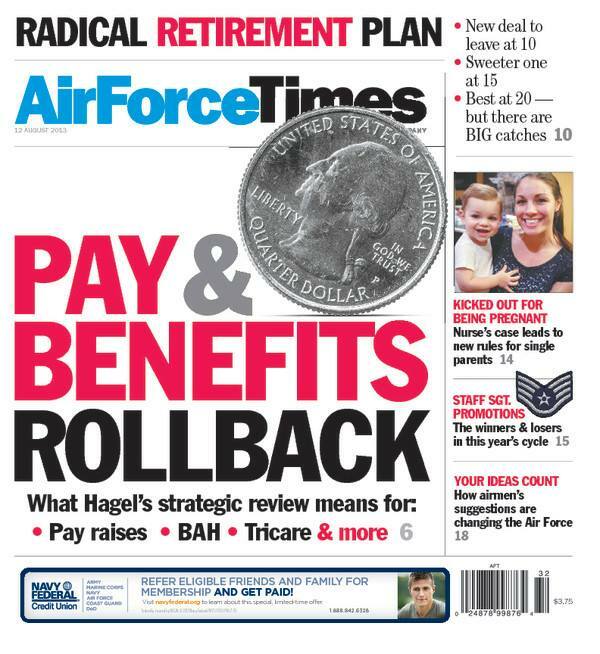 In this week’s edition, you can read what prompted the Air Force to make these changes and how they affect women who become pregnant during training. Also this week, the latest staff sergeant promotion rate is the worst in 15 years. Air Force Times looks at why there are fewer opportunities for enlisted airmen to advance. Meanwhile, the Air Force is soliciting suggestions from airmen to solve its toughest problems, from how to save money to how to prevent sexual assaults. Vice Chief of Staff Gen. Larry Spencer talks to Air Force Times about which suggestions have already been implemented. You can also read the inspiring tale of an explosive ordnance technician who lost an arm and both legs in Afghanistan is helping to develop more advanced prosthetics that will give wounded warriors more control over and movement. And a scammer is claiming to be Gen. Frank Gorenc, who recently became commander of U.S. Air Forces in Europe. Air Force Times shows you how the imposter operates.